We are a vibrant community of faith bringing God and people together to know and live the Good News of God in Jesus Christ. 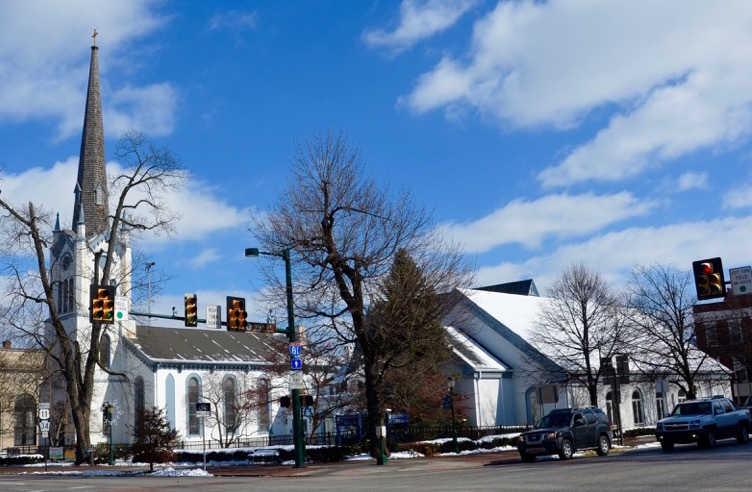 Located in Carlisle, Pennsylvania, St. John’s is a parish of the Episcopal Diocese of Central Pennsylvania, rooted in the Anglican tradition. Enriched by our worship, strengthened by our formation, stimulated by our outreach, and enlivened by our friendships, we are a community called to serve Christ in all people and in all places. If you would like sit quietly with the light pouring through our stained glass windows God, we welcome you. If you want to dive right into the life of an active church, we can help you find ways to connect with other people and deepen your faith. If you have been away from the Church and want return, we are here to help you worship God in the beauty of holiness. Whether you are a visitor for a special occasion, someone who has entered these doors for a moment of reflection, or are seeking a spiritual home—you are welcome at St. John’s. On any given Sunday, our pews are filled with people at every stage of life, from the US Army War College, Dickinson College, from lawyers, to teachers, to business people, to doctors, to artists and musicians, to stay at home moms to retired folks. 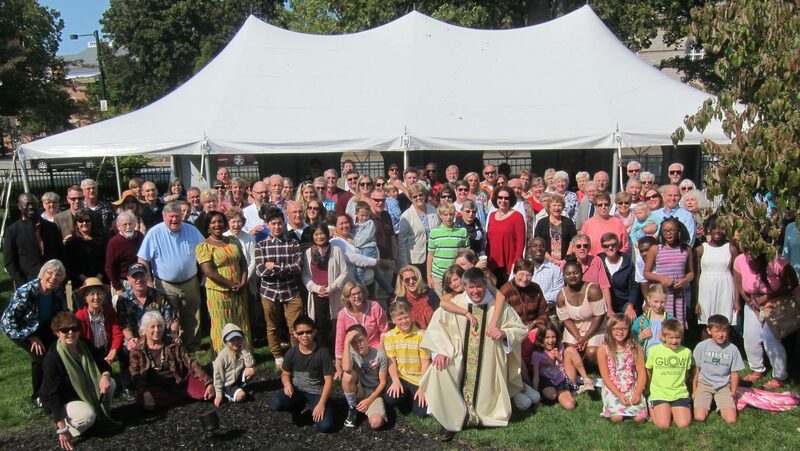 Our parish is a beacon in Cumberland County with the largest choral program and most active children and youth programs in the Episcopal tradition. Although we are a “destination” parish, we have many lifelong “Carlislians” who were born and raised here. We also have a population who returned to Carlisle after falling in love with the quaint and cosmopolitan town after short assignments here. We represent the breadth and depth of the Anglican Communion with parishioners hailing from Ghana, Liberia and other parts of the worldwide Anglican Communion. We cherish that breadth of age, experience, and background, and hope you will find a home with us. Newcomers are always welcome! 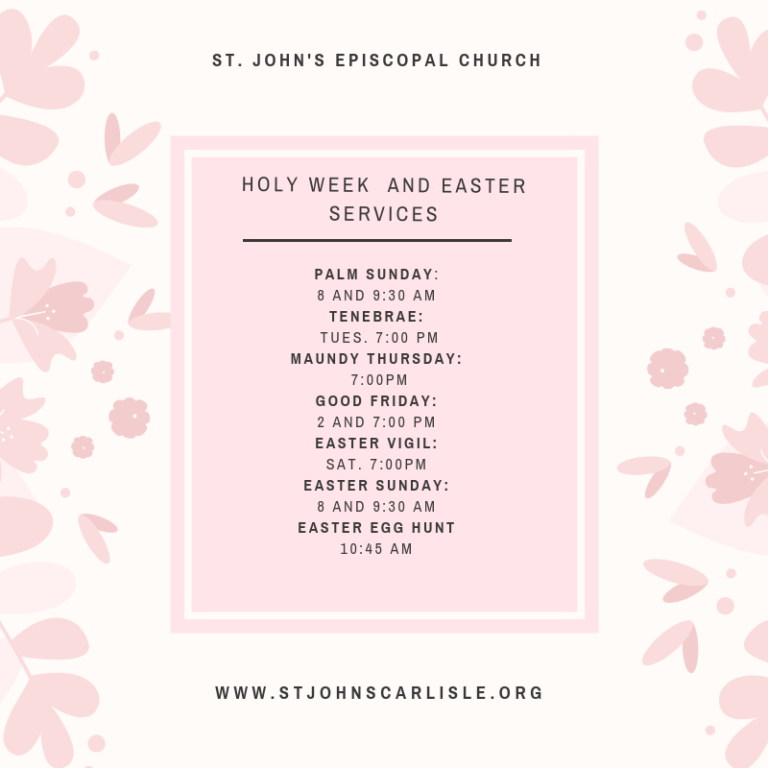 Our Holy Week Services begin on April 14. Easter Services are on April 21. St. John’s Episcopal Church is located on the square in downtown Carlise, PA.
Take US Rt. 11 south or PA Rt. 641 (Trindle Rd.) west to the square in Carlisle. Exit onto Rt. 34 North. Drive 3/4 mile to the square. Parking is along the streets or in the city lot behind the church along East Louther Street or the borough parking garage mid way along West Pomfret Street. Parking is free on Sundays.